This morning I did something I've never done in my life. I got out of bed, groggier than usual, stumbled to the bathroom, and instead of taking my usual morning pills from my little pink pill box, I took a sleeping pill by mistake. I guess in my blurry thoughts I figured I really needed to get some sleep and should do something about it! A sleeping pill at 7:00 AM! WHAT? This was no way to start the day! Well, I had to get to work so I headed out as usual. I must say I was very relaxed. VERY relaxed. I ended up being late, but did it bother me? Heck no! I was going as fast as I could. When I arrived, (I was on automatic pilot) I casually headed to my office and had a strong cup of coffee. Then another. Then one more for good luck. By 10:00 AM I was more or less back to normal. Well, at least I wasn't falling asleep. Luckily I didn't have any meetings this morning or I would have looked suspiciously hung over. 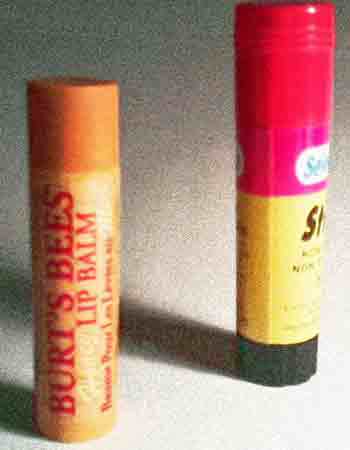 While downing my caffeine fix, I noticed that in my desk drawer I have a glue stick right beside a lip gloss. Am I just inviting trouble? The obvious result of a switch could be pretty sticky. This is all just another reason I HAVE to get organized. HAHA Yes I really think you should keep the glue and chapstick in seperate drawers. Glad the sleeping pill didn't ruin your day. I salute you, that pill would have provided my perfect excuse to crawl under the duvet for an extra blissful, guilt-free couple of hours of sleep! Hi Shrinky - guess I was too dopey to be that smart (if you know what I mean). I think I need a day off! Hi Sara Louise - OMG! No, I hadn't heard about that! Now I don't feel so bad. On the other hand, he's probably about 95 years old which is pretty much a good excuse for most things. Hi! Just Hopping in for the first time. I've done the morning/night pill mix up a couple of times. Things tend to go wrong when I'm on auto-pilot. Glad to know other people do this too! Will be joining your book site - looks great!